Everton's rise to the top in the sixties was mainly due to the new chairman, John Moores. Moores had made a fortune with Littlewoods (pools, department stores and a mail order company), which he had created. He was prepared to finance new players for the club. Harry Catterick was chosen as the new manager in 1961. Catterick had played as a centre-forward for Everton in the late forties. Success was quick to follow. Probably the worst winter in League history was 1962-63, which led to hundreds of postponements, but it didn't bother the Goodison men. They had the revolutionary advantage of a heated pitch. They won the title without loosing on home soil - the first time in the club's history. Who were the players to bring home the title, then, after a gap of 24 years? The defence featured new signing and athletic keeper Gordon West, the classical fullback Alex Parker, and Brian Labone, a home-grown player who lead the defence with his fantastic attitude. Jimmy Gabriel, right-half (the current reserve manager) was an important player with his huge work-rate. Brian Harris, the utility player was an important team-member until displaced by the tough but skillful Tony Kay, imported from Sheffield Wednesday in the middle of the season. Other players included inside-forward Dennis Stevens, the skilled outside-right Billy Bingham, who was later displaced by Alex Scott, a move that grabbed the headlines when he was bought from Glasgow Rangers, and Johnny Morrissey, a cheap buy from Liverpool early in the season. There were two players, though, who stole the headlines: the goal-scorers Roy Vernon (24 goals) and Goodison legend, Alex "The Golden Vision" Young (23 goals). Welsh national team captain Vernon had the skill to score from the most bizarre places. The Scot, Young wasn't a traditional centre-forward, but a skilled player, who the fans loved and adored. Young was often invisible for long periods of a game, but then he suddenly scored with a spectacular goal. Everton went to the Champions Cup with big hopes, but they were drawn against the best team in Europe, Inter Milan, in the first round. The Toffees were unable to score at Goodison (0-0) and lost at San Siro 0-1. A debutant at that match was the 18-year old Colin Harvey, a home-grown player. All went wrong for Kay later on: he was sentenced to prison and banned from football for life after being convicted of taking bribes while playing for Sheffield Wednesday. 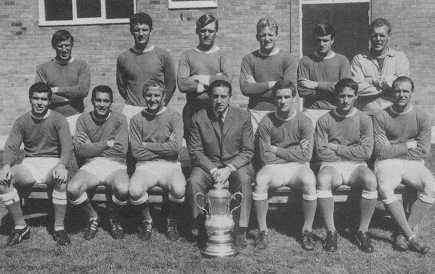 Most of the players above helped Everton to Wembley for the first time in 33 years, in 1966. Everton had beaten a star-studed Manchester Utd team 1-0 in the semi-final. Harvey, a skilled player with great passing ability, was a regular in the midfield, and Ramon "Ray" Wilson was bought in from Huddersfield. Wilson was one of the classiest left-backs ever seen. Vernon wasn't playing any more, and was replaced by a more traditional centre-forward, Fred Pickering, who was bought from Blackburn with a new record fee of £85,000 Pickering had already played in the England squad. Pickering had suffered from injuries late in the season, and couldn't play in the semi-final, but was fit for the final. However, Catterick surprised everybody by not picking him to face Sheffield Wednesday. Instead he chose the relatively unknown Mike Trebilcock, who had only played 7 League matches previously. Ray Wilson won the World Cup with England that summer. Wilson had 63 caps, 33 while at Everton (see Everton internationals). As proof that Goodison Park was one of the finest stadiums in the country (like always! ), it had been selected as one of the major venues for the World Cup matches. One of the semi-finals was played there  it should by rights have been England v Argentina, but that was switched to Wembley by the FA, to keep the England team in London. During the first round, Pele and Eusebio among others had graced the Goodison Park, as well as the surprising heroes of North Korea. The perpetual motion machine of the England side, Alan Ball, was the hottest player in the transfer market after the World Cup. Catterick finally beat Leeds' Don Revie in the fight, and bought the red-headed terrier to Goodison in August 1966 for a new record fee of £110,000. Ball was a world-class player, who could run forever, and hated nothing more than loosing  in this sense he would have made a lethal combination with Leeds' Billy Bremner. With his distinctive white boots and flaming red hair, Ball become an instant favourite of the Goodison crowd. When the stylish Howard Kendall was bought in March 1967 from Preston for £80,000, Everton had one of the best midfields in the League history: Kendall-Ball-Harvey, also known as "Los Tres Magnificos". Kendall had been the youngest player to play in an FA Cup final, until 1980. He has widely been regarded as one of the best players not to have won a single international cap. The team was near the top of the League for the next few years. In Spring 1968 they were in the FA Cup final at Wembley again after beating the tough Leeds team in the semi-finals with a solitary goal from Johnny Morrissey. The final was a huge disappointment when Everton, clear favourites, lost to West Bromwich and a solitary goal from Jeff Astle, scored during the first period of extra-time. Everton had beaten WBA in the league the same spring, 6-2 away! After the disappointing FA Cup final in 1968, Everton played well the following season, finishing third. Leeds won the title with a new record points-total of 67 (which would have been 94 under the current points system!). Everton were four points behind Liverpool, but scored the most goals, 77. The travesty of this success was that Everton couldn't compete in the Fair's Cup (forerunner of the UEFA Cup) the following season because, according to the rules, only one team could compete from each town, and Liverpool had finished ahead of Everton. Arsenal, finishing fourth, got in to the Fair's Cup, as well as Southampton (seventh) and Newcastle (ninth). Other teams that lost out on this ruling were Chelsea, Tottenham and West Ham. Joe Royle, who had made his break-through the previous season, was now Everton's top scorer at the age of 19 with 22 goals. Jimmy Husband scored 19 and Alan Ball 16. Husband scored his goals in only 36 games. During the season, Everton defeated Leicester at home by 7-1 (a hat-trick to Royle), Southampton away 5-2, and West Ham away 4-1. Everton also beat Wolves, West Brom (a hat-trick from Ball) and QPR at home 4-0! Everton got to the semi-finals in the cup, but lost to Manchester City by 0-1. The next season, 1969-70, showed what Catterick's new team was capable of. The midfield engine of Alan Ball - Colin Harvey - Howard Kendall played better than ever, beating even the "super-Leeds'" midfield led by Billy Bremner and Johnny Giles, by passing movements and dribbling skills. The season started earlier than normally (August 9th) and ended in April 8th, because England wanted to concentrate on the World Cup in Mexico the following summer. Right from the start the team showed their class, as they defeated Manchester Utd 2-0 away and 3-0 home within a week. Soon after this, Everton beat Leeds home by 3-2, thus ending Leeds' record run of 34 matches without a loss. Everton won 6 and drew one out of 7 matches played that August. Everton lost 0-3 to Liverpool at Goodison, but quickly put the record straight by winning 2-0 at Anfield. Other sweet victories included 6-2 against Stoke at Goodison, 5-2 against Chelsea (home), and Ipswich both home and away 3-0. Everton beat every opponent during the season at least once. The next time any team could match this was in 1984-85, and again it was Everton! The giants of Goodison Park won the title with a nine-point margin over Leeds (with the current system, it would have been a 17 points margin!) and managed only one point less than Leeds' record of 67 points (although with the current system, they would have had 95 points, a point more than Leeds, who would have had 94 from the previous season). The total attendance during the season was over a million, making the average attendance at Goodison Park 49,531. Gordon West, Brian Labone and winger Johnny Morrissey remained from the previous championship team. Apart from them, the midfield trio of Kendall-Ball-Harvey played a huge part, but there were more heroes in the team. Tommy Wright, who played one match in the 1970 World Cup (against Brazil), played all 42 matches at right-back. The Scot, Sandy Brown, played 31 matches at left-back, scoring five goals. Brown was replaced in the middle of the season by Keith Newton (played 12 matches), brought in from Blackburn, who played all but the Brazil match in England's brave World Cup campaign. John Hurst (surprisingly wearing the number 10 jersey) who played as the other centre-back, was ever-present and was constantly helping in the midfield and attack, scoring five goals and running creatively. The very technical Jimmy Husband, who was able to score from anywhere, scored six goals in his 30 appearances. Everton's centre-forward tradition was continued by Joe Royle, who once again scored a hat-trick and a total of 23 goals. The sensation of the season was, however, the 19-year old Alan Whittle, who Catterick put on the field, when Everton weren't performing so well in January-February, and had only won one in six matches. Whittle replaced Husband, and scored 11 goals in 15 matches. The title was clinched at the end of March, when Whittle scored in six matches in a row. Labone and Ball were England's most influential players in the World Cup. Other candidates for the team, apart from Newton and Wright, were Joe Royle, who was finally left out, and Gordon West, who shocked the footballing England when he said he preferred to be at home with his one-month old daughter rather than sit at the bench in Mexico (Gordon Banks was England's number one, of course). The big mystery is, how the team fell apart so quickly. The team had a wonderful future ahead, but they never won anything else. This was a situation reminiscent of the 1928 team, although then the recession wasn't so long. The main target of the 1970-71 season was the Champions Cup. It started well, when Everton beat Keflavik and Borussia M&ounchengladbach (in a penalty shoot-out). Everton met Panathinaikos in the quarter-finals. They should have been an easy opponent, but the home leg ended 1-1 (David Johnson equalised with the last kick of the match) and the away leg finished 0-0, even though Everton had a lot of chances. Panathanaikos lost the final at Wembley (what a chance it would have been for us!) against Ajax 2-0. To top it, Everton lost to Liverpool in the FA Cup semifinal by 1-2, even though Ball had put Everton in front. These catastrophes were a bad thing for team morale and it has been said that they were the reason for Everton's slide. Whether this is true or not, the slide was impossibly steep. Finally Catterick got fed up with Alan Ball, and sold him in December '71 to Arsenal for a new record fee of £220,000. Catterick's health gave away, and finally he was moved to administrative duties in spring 1973. Billy Bingham, a League champion with the 1963 team, was chosen as the new manager.